The 8% Income Portfolio: Second-Quarter 2017 Review. We will provide updates on changes and additional investments made since April 2017. We will present the updated buy and sell rules. The portfolio continues to comfortably meet its twin goals: 8% income, and capital preservation. The portfoliopresents a viable alternative to a balanced stock-bond portfolio. As usual, wewill compare the performance with the 60:40 stock/bond portfolio. For the benefit of new readers, here is some background information. We launched this income-centric portfolio in October of 2014, with the dual purpose of providing high current income and preserving the capital. The primary goal of this portfolio was to provide roughly an 8% income while preserving the capital. The secondary goal was to provide some capital appreciation over the long term (please see full disclosure at the end of the article). You can read my original article here and the previous update here. Just to provide a recap, a total amount of $100,000 was allocated initially to the portfolio, and another $100,000 was contributed in the next 12 months ($8,333 in 12 installments). Thus the total cost basis is $200,000 (excluding the reinvested dividends). To achieve a high current income, we utilized a diversified group of CEFs (closed end funds) for this income-centric portfolio. We have chosen to invest in 12 CEFs to provide us a broad diversification, high distributions, and exposure to different types of assets such as Equity, Bonds/Credit Securities, Utility, Infrastructure, Energy MLPs, Preferred Income, Floating-rate Income, etc. Currently, we also have two individual company stocks in the portfolio besides 12 CEFs. This portfolio is reasonably stable and mature now, and we needed to automate our buy and sell decisions to bring consistency and to avoid any bias. Also, this will ensure that we are investing at regular intervals and do not have too much cash sitting in the portfolio. Our new buy/sell rules will attempt to figure out which particular investments/securities are under- or overrepresented in the portfolio, in combination with valuation. Divide the current market value of a position by the total current value of the portfolio to calculate the under- or overrepresentation ratio for the position. 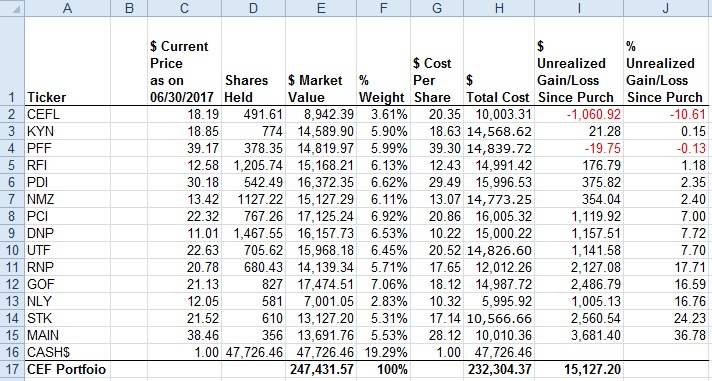 Divide the cost-basis of a position by the total cost-basis of the portfolio to calculate the under- or overrepresentation ratio, for the second time. Combine the above two factors, assigning an equal weight (50% for each). If the security is under-represented, and the profit/gain percentage till date is no more than 15%, buy an additional quantity enough to offset the underrepresentation. If the security is overrepresented, and the profit/gain percentage is more than 25%, sell partial quantity enough to offset the over-representation. The frequency of this exercise can be monthly, bi-monthly or quarterly. But we have chosen monthly at this time for this portfolio. This portfolio already has 12 CEFs and two individual stocks, and as such, it is reasonably diversified, so we do not need to add any new positions. But we still needed to invest more of our cash, since we held $52,642 as of our last update at the beginning of April 2017. In addition, we add roughly 8% income from dividend/distributions from the invested funds. Furthermore, we are not withdrawing from this portfolio model, so we need to deploy the extra cash on a regular basis. For folks who may need to withdraw for income, we recommend a withdrawal rate of 5-6% maximum and investing the rest back into the portfolio. As stated above, we created a new formula to help us determine which securities to buy or sell and how much. The decision is based on the valuation of various securities and the degree to which they are under- or overrepresented within the portfolio. However, once we have this guidance available, we would look at additional factors before we make a final decision. Note that we excluded CEFL from this exercise, because of our decision to limit our exposure to this somewhat speculative security. Note: Formula for each column can be seen from the GoogleSheet. Based on the above sale/purchase decision tables, here is the summary of buy/sell during April – June 2017. The table below shows the funds in the portfolio in the order of performance (from worst to best) as of June 30, 2017. The performance has been calculated and sorted after including the dividends. For the year 2017, the projected yield is in the range of $17,000 to $17,500, which will be 8.65% on the invested capital excluding cash. Here is the portfolio as of 06/30/2017. The gains/losses shown below are without counting dividends, as they are not re-invested into original securities, but get deposited as cash. Earn current income of 8% and preserve capital. Provide better performance overall when compared to Stock-Bond balanced portfolio. Provide at least 2% capital appreciation over the long term. During the second quarter of 2017, we earned an income of $4,054, and $34,750 since inception. The projected yield for 2017 is in the range of $17,000 to $17,500. The yield on the deployed funds is approximately 8.65%. The yield on cost comes to 8.65% as well. However, the yield drops to 6.99% on the current market value of the portfolio, as we are still carrying over $47,000 in cash, which represents 19.30% of the portfolio and growing. Capital preservation: Including dividends, the portfolio is up by nearly 24.0% as of 06/30/2017. We have always carried a large amount of cash in this portfolio, ranging from 40% to 20%, mainly due to our inability to invest fast enough at attractive valuations. If we were to exclude cash, assuming it represented an average of 25% at all times, the annualized return since inception would exceed well above 12%, including dividends. However, that probably will not be the correct way to look at it. So when we include the cash, the annualized return falls to 9.2%. Nothing to brag about, but still decent. As always, we will compare this portfolio with 60/40 stocks/bond allocation portfolio, which mirrors the invested amounts at different times. The hypothetical stock/bond portfolio has a 40/20/40 allocation to Vanguard Total Stock Market ETF (NYSEARCA: VTI), iShares MSCI EAFE - International (NYSEARCA: EFA), and (Vanguard Total Bond Market Etf (NYSEARCA: BND). In the case of stock/bond portfolio, the dividends are reinvested, so in a way, there is less of cash earning nothing. So far, the 8% Income Portfolio has consistently beaten the stock/bond (60/40) portfolio on both total return and income for the majority of the time. We provide this quarterly review for our readers who may be following the progress of this portfolio on a regular basis. Of course, we welcome new readers and followers who may be interested in this kind of portfolio, and they are encouraged to read the previous articles and updates on this series. We believe, this portfolio presents a viable alternative to a balanced 60:40 stock/bond portfolio. Also, one of the great benefits of this portfolio is the constant stream of income, and one does not need to sell shares to withdraw income. It appears that in good times (bull market), this portfolio, after including the dividends, should match the broader market performance. However, more important is that during tougher times like early 2016, the cash dividends should help protect the downside considerably. Please note that this portfolio will not protect from a broader market crash or correction. To avoid getting caught in a situation like 2008, an investor could invest gradually over a period of a few years, adding equal sums of money every year, which would hopefully smooth the ride. We also have an alternative portfolio, the 6% Income, Risk-Adjusted Portfolio, to limit the downside and risk from such a situation. We will like to remind once again that this portfolio should not be considered as a "core" portfolio. In our opinion, depending upon the individual situation, no more than 25-40% of the investment assets should be allocated to this kind of portfolio. Please do your own due diligence before investing in such a portfolio. Please see my other portfolios with unique goals and risk levels. For regular updates and to keep track of these strategies, please consider following me. The Passive DGI Portfolio - Dividend Strategy with 30 Stocks. 6% Income, Risk-Adjusted Portfolio - CEFs Using Risk Rotation Strategy. Full Disclaimer: The information presented in this article is for information purpose only and in no way should be construed as financial advice or recommendation to buy or sell any stock. Every effort has been made to present the data/information accurately. However, the author does not claim for 100% accuracy. The portfolio or other investments presented here are for illustration purpose only. The dollar amounts in the model portfolio are hypothetical and may not match with Author’s actual investments. Disclosure: I am/we are long GOF, KYN, MAIN, NLY, NBB, PCI, PDI, PFF, RFI, RNP, UTF. Disclosure: I am/we are long GOF, KYN, MAIN, NLY, NBB, PCI, PDI, PFF, RFI, RNP, UTF. I wrote this article myself, and it expresses my own opinions. I am not receiving compensation for it (other than from Seeking Alpha). I have no business relationship with any company whose stock is mentioned in this article.